This Vancouver Corner Sofa Group is fantastic value, Was £699.99, Our Price £569.99 (including delivery). It's a new year, so why not get a new sofa!!! Available in left or right hand options and 2 colours. 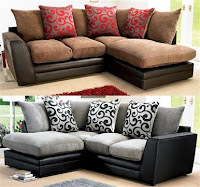 The Vancouver combines contemporary styling with comfort, mixing a faux hide look outer in a choice of brown or black with chenille seat cushions and backs with layer accents. Dimensions: Width 218cm (85 3/8"), Depth 173cm (68"), Height 84cm (33").